Sandpiper Publications: Narrative cards - Who? Narrative cards - WHO? is a great compliment to the Story Box program. 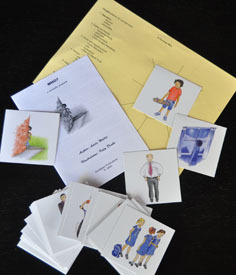 A set of forty full colour cards, depicting various story characters, for use in narrative therapy. Characters range from children to adults and represent a multitude of possibilities. Working with children who are struggling with the narrative, often the very first block is in tying to get an initial idea. These cards will offer children from 6 to 16 years of age a great range of possible story lines. Children are encouraged to consider a potential story character and work through a set of concept circles, starting from a concrete physical look at the character, moving gradually into the more abstract concepts of personality, strengths and weaknesses, interests and friendships, until a complete picture of the character has emerged. Once the character has been fully set, the story ideas will flow. As part of the concept web process, the child will also have developed a great vocabulary set to rely on for his or her story. Simple and effective to use.